§ 14 Responses to Yamazaki = the perfect summer night! Thanks for commenting! I love the Suntory tastings – were they able to serve the cask strengths from the three different oak casks at the event you attended? I went to one in the Spring where they did this and I thought it was a fantastic way to learn the different characteristics each oak barrel gives to the whisky. We tasted the cask strength from the Japanese Oak, American Oak & Port Casks and then tasted the Yamazaki 12, 18 & Hibiki 12 to understand how these three casks work together when blended. Great products. Plenty of other japanese whiskies i want to taste though! Nikka for example, any you’d recommend!? Both Yamazaki’s are fabulous! We’ve had several bottles of the 12 in our midst over the past couple years and the 18 has been on my “must buy” list for quite some time, but at $120/bottle, I’ve been holding off. I never thought to have it as you’ve described. Love the food, love the whisky. May have to pull this together! Have you had the Hibiki 12? Also delicious and very reasonably priced. Beautiful bottle too! I love that we share similar whisky-likes. 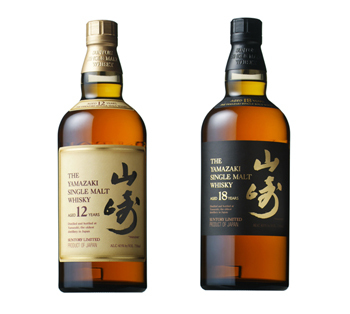 I’m so with you on the Yamazaki 18. In fact, that was the whisky that turned me into a whisky lover … we all have one. Do you remember what yours was? I had a bottle of the Hibiki 12 a long time ago and don’t really remember it too well … (except for the beautiful, cylindrical bottle) the Yamazaki 12, however, is definitely a main-stay in our whisky collection. Did you ever get into your Nikka? I have loved whisky for a long long time. Started off with Bourbon and Ginger Ales and slowly moved towards drinking it straight (Old Grand Dad + Maker’s Mark). Knob Creek really turned me on to straight bourbon, and a Johnny Walker Journey of Taste event got me into Single Malts (shameless plug alert! Here’s the story: http://wp.me/pT4Is-7y). I had the Yamazaki at a Scotch Malt Whisky Society Extravaganza event, and absolutely loved it. Luckily, my fellow bloggers have had bottles of the 12 around as well as the Hibiki on numerous occasions, so I have them quite often. Gotta get the 18! As far as the Nikka, I finally had it last night. Loved it! That’s all I’ll say for now. Stay tuned for the review which will be up in a week (will be on vacation next week, so we’re scheduling posts). I love hearing how people “get into” whisky – it’s so different for everyone. I’m impressed that you remembered the Yamazaki after an event as big as the Scotch Malt Whisky Society Extravaganza (thank goodness your friends had it on hand for plenty of “refresher” tastes!). I can’t wait to read your post on the Nikka – I’m sooo curious to hear your thoughts & read your tasting notes. Would you go on vacation already!? Jk. Yea … my job is alright 😀 It’s great being your own boss and I’m so lucky to be able to meet and socialize with some really interesting & creative people. I just updated my “about” page with a link to our new FB page if you want to see more. In the mean time, I’m happy to say I will have more to report in the next 6 months so stay tuned! Actually, I was seeking out the Yamazaki because I had heard so much about it. Hopefully, as Japanese whisky starts to catch on, there will be more of it available. And as far as vacation goes, we’re leaving tomorrow night. Looking forward to a week away! Hope to come back with some interesting stories to share. Took a look at your Facebook page. Very very cool! I am so jealous. I have no doubt that it’s hard work, but I bet you get to actually have some fun. Looking forward to hearing more about what you do to pay the bills! The Yamazaki 18 and the Lagavulin 16 was what really converted me from a wine only person to a whisky (primary) and wine (secondary) person. It’s become a virus now. It’s amazing how quickly and deeply you start appreciating the finer whiskies. Thank you so much for your insightful share. I couldn’t agree more with your fine choice of drams. I was at the Yamazaki distillery not too long ago and joked with them that they’re to “blame” for everything that happened to me after my fist sip of Yamazaki 18! 🙂 Great people, awesome whiskies. Lagavulin 16 is also a fine choice! On a different peated journey, I’ve been really into the Highland Park 18 this summer (more floral/lavender peat as opposed to the big, beautiful, leather/smoke of the Islays). Thank you so, so much for your Brenne support!!!!!! It humbles me to know that people are really enjoying it. Truly. THANK YOU! « Whisky on the Hudson, WhiskeyFest and WhiskyWeek, oh my! You are currently reading Yamazaki = the perfect summer night! at The Whisky Woman.